Pressing and holding buttons is so boring. 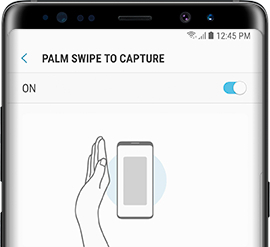 Learn how to take a screenshot with just a swipe of your palm. Note: Set the device to capture a screenshot when you swipe your hand to the left or right across the screen. You can view the captured images in Gallery. 4. Navigate to and touch Palm swipe to capture. Note: This feature is activated by default. Important: It is not possible to capture a screenshot while using some apps and features.